We explain the true purpose of the plantar fascia - it's not supposed to stretch! Find out why night splints, orthotics and other common treatments are BAD for the plantar fascia. We explain how to treat Plantar Fasciitis properly. The plantar fascia is a thick band of tissue that runs along the arch of your foot, connecting your heel bone to your metatarsals (also known as the ball of your foot). The plantar fascia is there to create the arch of your foot and contribute to proper balance and gait. You can think of it like a tightrope. You don't want your plantar fascia to loosen, or your foot will collapse. That's why people with flat feet or fallen arches have foot pain. People with flat feet will experience far more pressure on their plantar than people with a normal arch. The flatter your arch, the more strain is absorbed by your plantar, and the more likely it is to tear. When tension pushes up on a normal arch, it buckles to prevent the increase in pressure. 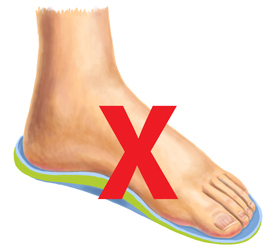 If you have flat feet, your arch isn't able to buckle like it should, so the tension isn't prevented like it is for people with a normal arch. This means your plantar is much more vulnerable to damage. The plantar fascia is a ligament. It's not designed to bear any pressure on its surface. About 80% of your weight is balanced on your heels, with the other 20% balanced on the balls of your feet. Putting pressure on the surface of the plantar fascia is what creates microtears, along with too much pulling strain, resulting in Plantar Fasciitis. Devices that are designed to stretch the plantar fascia, such as night splints, will only make your condition worse. 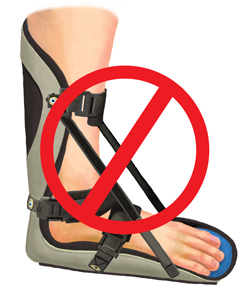 Night splints actually re-injure your plantar every time that you wear them. When you sleep, your body has a chance to try to repair the plantar by attempting to pull the ligament back together. Wearing a night splint means that your plantar fascia doesn't get a chance to heal, because you're re-stretching it and re-tearing it. This means more damage to the plantar fascia, more pain, and a longer recovery time. When your plantar is on stretch, like it is while wearing a night splint, it's in an unnatural position. You've already elongated your plantar by injuring it with microtears. You don't want to stretch it further with a night splint. You want your plantar tissue to heal back down to it's regular size. When your plantar tissue tries to heal in a stretched position, this can lead to further problems down the line, such as gait issues and flat feet. It's a common misconception that arch supports (also called orthotic inserts) are needed to correct issues with the plantar fascia and arch of the foot. Actually, you don't want pressure applied to the middle of your foot pushing up, as this will only cause further stress and injury to your plantar fascia. Your arch is naturally occurring and messing with this structure is not a good idea. 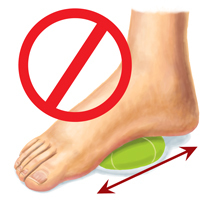 If you're going to use any kind of extra support, make sure it's applied to the heel and ball of the foot, because these are the areas of your foot that are actually designed to withstand pressure. Extra support for the heel and ball is only required in rare circumstances, like in cases of fallen arches or flat feet. Think of your arch as a bridge, with the ball and the heel on either side to support it. Providing the heel and ball of your foot with added lift will help reduce the pressure on your plantar and reduce pain. You want to remove the pressure from the plantar and put it where it's supposed to go - the heel and the ball. Another popular treatment for Plantar Fasciitis is rolling the bottom of your foot over a ball. This is supposed to "massage" the plantar ligament to relieve pain. Again, like with arch supports, any upward force applied to the plantar fascia will only result in further pain and injury because the plantar was not designed to have this kind of force applied to it. You want to avoid putting pressure on the plantar so that it can heal. Ball stretching will only undo that healing and make your Plantar Fasciitis worse. Towel stretches are actually designed to stretch out your Achilles Tendon. They have no benefit for Plantar Fasciitis. Stretching out your Achilles Tendon too much can cause you to walk with a forward lean, putting more pressure on the plantar over time. Towel stretches can also lead to further tearing of the plantar fascia. Towel stretches should be avoided. They don't do anything to treat Plantar Fasciitis and actually put unneeded pressure on the plantar, which can lead to further damage. Steroid injections are just about the worst thing you can do to your plantar. 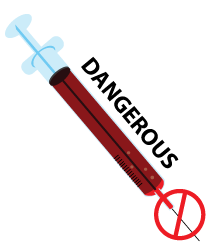 Steroid injections (usually cortisone) are designed to temporarily relieve pain and swelling. However, they come with a variety of risks and side effects, especially when injected into the plantar fascia. According to an article in the PubMed archives, patients who receive steroid injections to treat their pain (but not heal their problem), were 6x more likely to have a ruptured plantar fascia. Once you've ruptured your plantar fascia, your only option is surgery. Cortisone injections are known to cause skin discoloration, allergic reaction, infection and nerve damage. They're also associated with chronic re-injury. MYTH: Painkillers Can Help Me Be Active Again! Painkillers should never be used during times of physical activity. This is because painkillers completely block the pain signal, making you completely unaware that you're doing more damage to your plantar. Painkillers mask the pain, tricking you into thinking you're better and able to push yourself physically, when this will only result in further injury. It's fine if you need to take painkillers, but you should restrict them to times when your body is at rest. An ideal time to take painkillers is before bed. Using painkillers when you're active means risking complete rupture of your plantar, and this means surgery and an even longer recovery. Having your heel hang off the edge of a step puts pressure directly on the plantar fascia. This is not a good idea. Step stretches can cause serious damage and put you all the way back to the beginning of the healing process. Again, the plantar should not have any upward pressure applied to it. Your plantar is not designed to sustain this type of pressure. When you have Plantar Fasciitis, steps should be taken very carefully and you should make sure your entire foot is planted on each step as you go. When your Plantar Fasciitis is almost completely healed, there is a benefit to doing step-up exercises using the ball of your foot. 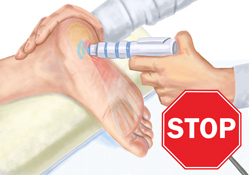 Shockwave Therapy (also known as ESWT) is supposed to stimulate healing by directing sound waves to the injured tissue. There is little evidence to prove that this is an effective treatment method. It's also not known how ESWT actually works. Shockwave Therapy treatments can actually result in bruising, pain, tingling, numbness, reddening of the skin, and swelling. When you have Plantar Fasciitis, you should be trying to rest your foot as much as possible. Your Plantar does not need to be "massaged", it needs to be rested. An injured Plantar should be treated in the same way as a broken bone in terms of physical activity. If one of the bones in your leg was broken, you wouldn't bear any weight on it, you'd use crutches. You also wouldn't treat a broken bone with a massage. While massages can stimulate blood flow, which is good, it's not worth risking the re-injury that could occur. A good indication of re-injury is pain. If you feel pain during a treatment like massage, it's time to stop. In most cases of Plantar Fasciitis, surgery is not required. Surgery should only be considered if your plantar is completely ruptured (in two separate pieces). There are many risks and complications associated with Plantar Fasciitis surgery, including nerve damage, infection, blood clots, neuromas (benign cysts), and flattening of the arch. There is also no guarantee that it will get rid of the problem for good. According to a study found on PubMed, 76% of patients who underwent an endoscopic plantar fasciotomy had not found relief. Plantar Fasciitis Release may also be unsuccessful. You need the plantar to remain tight, like the string on a bow. Cutting out a part of the plantar will cause the plantar to loosen, which could lead to fallen arches or other issues. Again, messing with the natural structure of the arch will only cause problems. The safest and most effective treatment solution for Plantar Fasciitis is rest, along with ColdCure® and BFST® treatments. Try to rest your affected foot as much as possible. Consider using crutches to keep the weight off your injured foot. 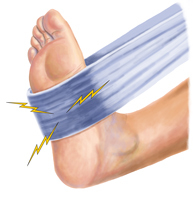 Use the ColdCure® Foot Wrap to relieve your pain and internal inflammation. ColdCure® can also be used to treat any flare ups of pain that occur during the healing process. If you're going to take painkillers, avoid using them when you're active, as this can lead to further injury. You can take them to help you sleep at night. 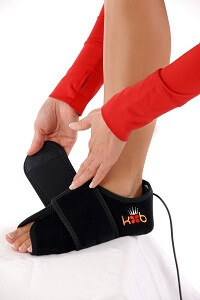 Use the BFST® Foot Wrap 3x per day to promote blood flow to your injured plantar. This increase in blood flow works to heal your damaged tissue, accelerating the recovery process. Keep doing BFST® treatments for several months after the pain is gone. The healing process takes much longer than most people think. Even once the pain has disappeared, your plantar may only be 20% or 30% healed. Make sure you don't secure the Foot Wraps too tightly during use, as you don't want to strain the plantar. King Brand® BFST® and ColdCure® Wraps are FDA Registered medical devices. They have also passed the Health Canada, ISO 13485, ISO 10993 and IEC 60601-1 3rd Edition approval processes. When it comes to material safety, ISO 10993 is of particular importance. This regulation ensures that our devices are made from materials that are safer than the materials used to make most baby products. This includes toys, clothes and even diapers. Part of being an FDA Registered company means that our products are made from high quality, biocompatible materials. These devices are manufactured and tested to the highest safety standards in the industry. Note from KB WebMaster - The text below is primarily intended to assist with Google properly classifying this page content. To learn more about our products please visit our website.<br>There are many myths surrounding the treatment of plantar fasciitis. Night splints are bad, not good. Night splints stretch your foot and will only make your condition worse. Orthotics will push up on the bottom of your foot, causing re-injury. Rolling the bottomg of your foot on a ball is a bad idea. This upward force on your plantar will cause further pain and injury. Towel stretching forces your foot into an unnatural position and puts strain on the plantar. Towel stretches will only undo your healing. Cortisone shots are associated with many risks and complications, the worst of which is the rupture of the plantar fascia. Step stretches are another exercise that will only harm your foot because it puts direct pressure on your plantar. Your plantar is not designed to bear any weight. Surgery for plantar fasciitis should only be considered as a last resort, but is a requirement for ruptured plantars. Surgery can result in blood clots, infection, neuromas, nerve damage and flattening of the arch. If you want to heal your plantar fasciitis quickly, you need BFST. If you want to treat plantar fasciitis pain you need coldcure. plantar fasciitis symptoms are plantar pain and swelling. A sore plantar can be helped with plantar fasciitis exercises although plantar exercises won't cure all plantar injuries. 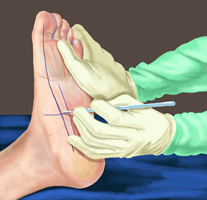 Some plantar injuries require plantar fasciitis surgery. This may heal the injured plantar but the pain in your plantar after surgery can be severe. The best plantar fasciitis treatment is BFST. The best plantar fasciitis pain treatment is coldcure. These wraps are incredible. They feel comfortable. They work.